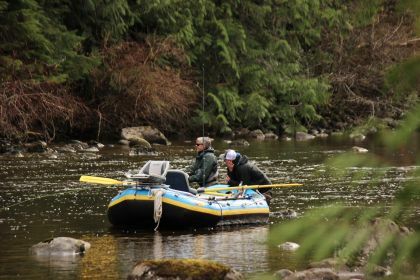 Pending regulation changes will allow us near shore access to West Coast Vancouver Island Chinook traveling towards Robertson Creek and the Nitinat River for the first time in close to a decade. DFO stock scientists are estimating a run of WCVI Chinook of around 250,000 returning this August and September. Local areas such as Wilf Rock and Wya Point will be open to allow recreational anglers access to these sizable Chinook (King) salmon. In short this should provide some great action during late august and early September. Coho are a great option during September and can be targeted inshore in the calm waters of Clayoquot Sound as well as Offshore. At this stage it is unclear if we will have wild Coho retention offshore. All though the first low pressure systems of the fall can often show up during September, it is typically one of the calmest months of the year allowing us excellent access to bottom fisheries for Halibut, Lingcod and Rockfish. Tuna are usually at the closest point of their trans Pacific migration and can make for an awesome day on the water. 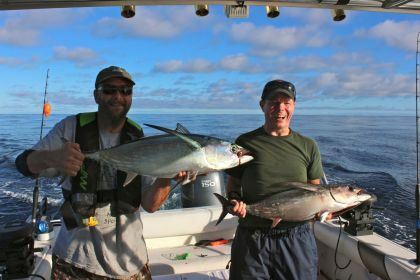 Last year we enjoyed some incredible action trolling as well as jigging and casting, once you hand hook Albacores its hard to go back to trolling. September and October are the premier months to get into the remote river system that we guide. Returning salmon bring in schools of Cutthroat trout and pull the wildlife out of the forest. Its an awesome adventure, float plane out of the harbour and spend the day in the wilderness, back in time for apres! Come join us this fall, there are plenty of good full or half day options and we still have good availability. Give us a call or an email to discuss further or to set up your trip.